We eat a lot of fresh salads in this spring sunshine here in Tenerife. Okay, not just during the afternoon when the sunlight is beating down on us with these warm temperatures, but also in the evenings. As hot dinners in this already warm, sometimes clammy weather can really make one feel rather tired, it's nice to have a refreshing salad such as this as a starter, accompanying plate of food or even a main course with some bread and a glas of wine. I've always found it interesting to play around with food flavours, not just with salads of course. It prevents me from getting bored of the same recipes over and over again. It applies to everything in life I guess. That said though, I have lost track of just how many times I have watched my favorite film repeatedly this week. 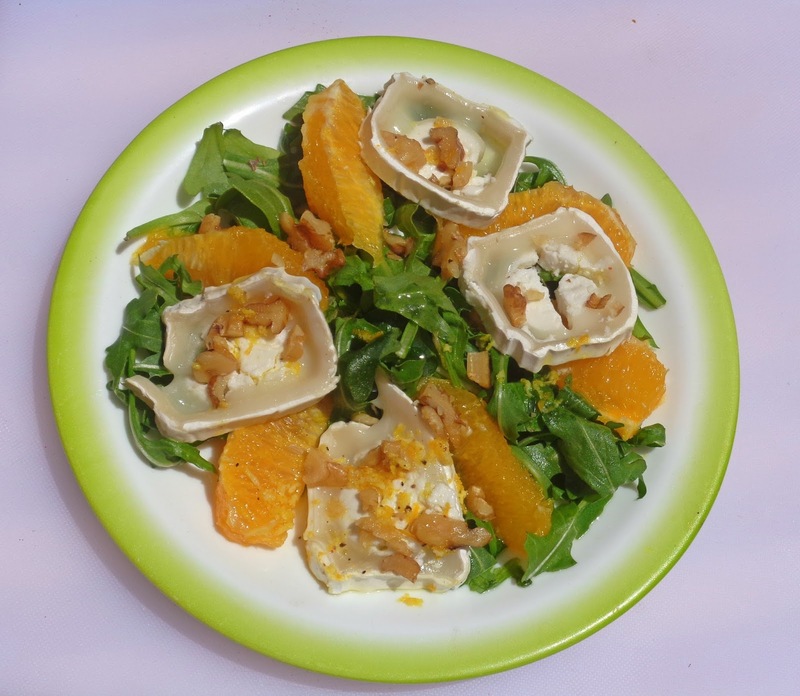 This salad can be prepared with many different types of goat's cheese (or cheesein general) to suit one's personal taste. I used plain goat's cheese here but I have been recommended Mató which is a fresh Catalan goat's cheese, or a mature French Sainte Maure. The forecast for tomorrow is set to be another very sunny and very warm day so I'll take up on that advice and make another goat's cheese salad for lunch. 1. Divide the rocket leaves between four individual plates. 2. 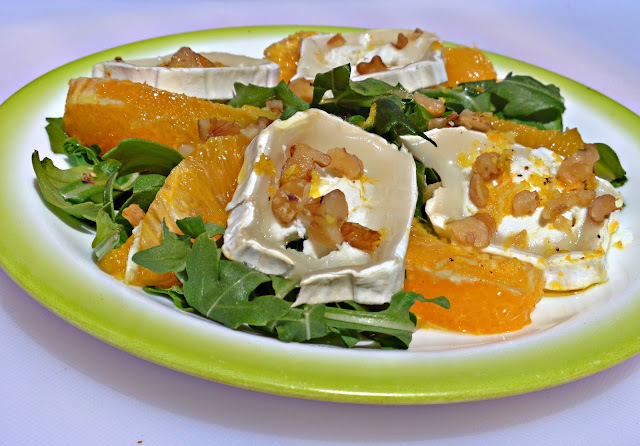 Arrange four to five slices of goat's cheese on each plate and place the segmented orange around the cheese and sprinkle with chopped walnuts. 3. Mix the dressing ingredients and beat well with a whisk or a fork. Pour over the salad and serve at once.